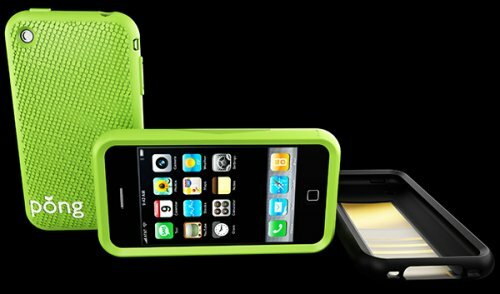 From the fine folks at Pong Research(They haven’t done much since testing Pong consoles in the late seventies apparently) come these anti-radiation cases for the iPhone 3G, iPhone 3GS and Blackberry Curve… Despite the fact that radiation from cellphones has not yet been proven to harm people. Check this out. A bunch of Sheep herder dudes in the Uk got together and armed with a bunch of LEDs and a camera created some amazing moving art. The best part? 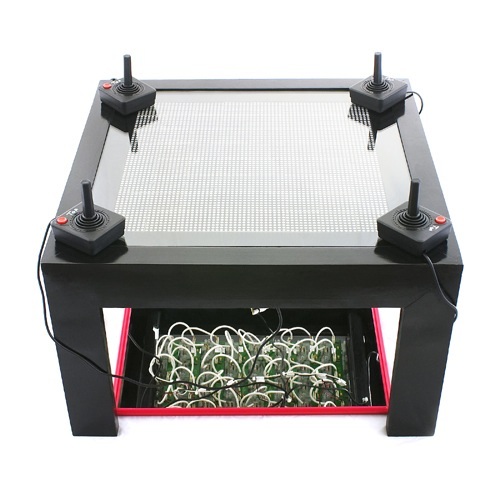 They create a giant Pong game with the LED wearing sheep. Sure there are a few stray pixels because the dumber ones can’t get it together, but it rocks. John Maushammer enjoyed some minor fame in geek circles with his Pong wristwatch, but he craved more. So he delivered unto mankind a new great thing. 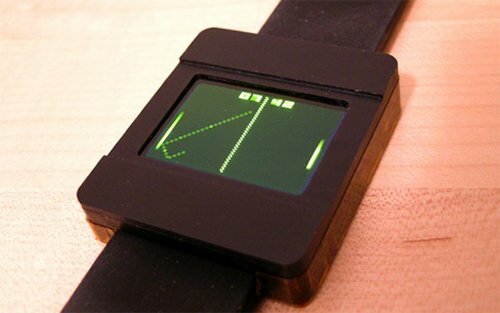 The DIY Asteroids Watch outdoes it’s predecessor. 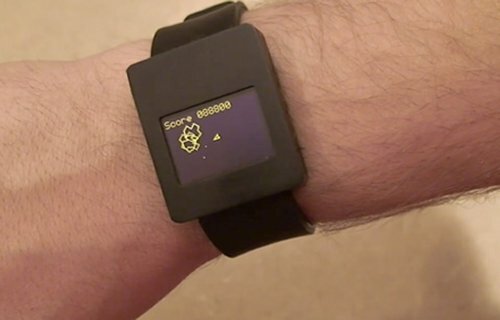 It even features a tilt sensor so the wearer can control the action by just tilting their wrist and going pew pew pew. Frankly, we could go on about it all day, but the bottom line is that the man is a DIY game watch god. Check out a video below. Pong is hip again. Or should I say wrist? The Homemade Pong Watch was created by John, a lover of Pong who managed to compress all of the electronics for the watch into a trim 10mm-thick case. The 96×64 OLED display runs continuously and as John points out, there is no need to press a button to see the time. Battery life is 25 hours, so recharging is done every night. It looks absolutely worthy of my wrist in action. I would watch it play all day and get nothing done. Check out the video below. Excellent work. So on the rare occasions when you venture out and get away from your mom’s attic, how do you geeks recognize each other? I’m guessing that one big giveaway would be this animated T-Shirt that plays old school Pong. It’s battery powered and it plays pong right on your chest. Just make sure that you remove the battery before washing! Venture forth my geek friend and as you journey out into the world, you and your shirt will collect fellow nerds as if you were the Pied piper of Pong. Pong has taken many strange twists and turns through our culture since the 70s and has somehow endured, despite it’s simple nature. Well, it’s back again and this time the game takes place on a table, allowing you to play and then dine. 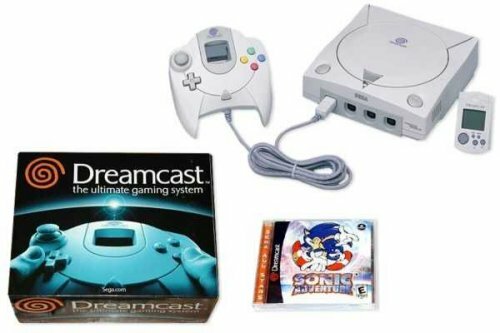 Or dine and then play a game for dessert. It’s from the mind of Moritz Waldemeyer. 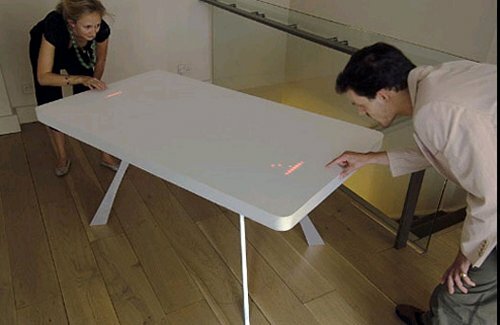 The table uses 2400 LEDs for display and has 2 trackpads. Turned on, the trackpads let users control the paddles. Turn it off and it’s just a plain table again. It was part of MOMA’s Elastic Mind exhibit. I for one would love to see it go into production, but somehow I doubt it will. For one thing, it would force you to clear the table everytime you want a game and that’s just a bit too much if you love Pong and dining.